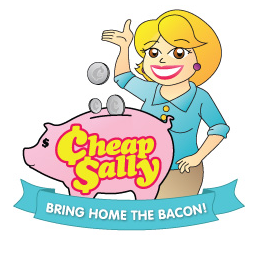 I hope that by now you have heard of the Cheap Sally Bring Home the Bacon $100,000 blogging contest. If not, you have been missing out! CheapSally.com is a couponing website where they add 400 new coupons per day and people using the site save an average of 15% off of everything they buy online. The site is looking for an official blogger for the entire year of 2012 to write about online sales and deals for an amazing $100,000 salary. Now this sounds like an amazing deal to me, yet I have heard some hesitation about this contest, and I think I finally figured out what's the deal here, so I am now giving you the reasons and answers why you should enter the contest. That's your annual income for blogging about deals and sales for one year. From your home. From the beach. In your sweatpants. There are not many blogging jobs with this salary out there, you might never get this opportunity again. Plus you could still totally keep writing your own blog and do other things as well. 2. Almost everyone can do it. "But I don't blog about sales and coupons." How difficult can it be to write about sales and coupons? It's not, and I know because I write about them. In fact, helping other people to save money feels really good, and it's a very rewarding job. 3. "But it's a voting contest!" - Your family & community will help. Part of the way the Cheap Sally contest is organized is a public voting contest for the best applicants per each state that starts September 1st. Please don't tell me you are giving up before even trying because it's a voting contest! Tell your husband, mother and your best friend the reason #1 and they will help you to get the votes needed. If you are determined and let your family and online community know you are serious about this - they will help you. You will figure out a large internal company newsletter, a specific niche community site or a church group or something similar to get people voting for you even when you have exhausted the traditional Facebook and Twitter. When there is a will, there is a way. Also, five entrants from each state whose submissions received the highest number of votes in their respective state will advance to Round 2. You might know a lot of great bloggers applying for this, but unless they are in your state, you have very good chances getting to the next round. 4. This will grow your brand. You will be part of a growing company owned by entrepreneurs who have a track record of success. Cheap Sally is based in Las Vegas, Nevada and is a subsidiary of Discount Savings and Flank Digital. Flank Digital is privately owned by a group of successful entrepreneurs. Being able to work with this caliber people will change your blogging career forever. Now, who's now ready to Bring Home the Bacon? Katja Presnal is an Addy Award-winning social media strategist and owns the Skimbaco® blog network and lifestyle brand. She inspires to live life to the fullest and does it by combining social media with everything else she loves. You can connect with her on Twitter @katjapresnal and read more at her blog Skimbaco Lifestyle.